One in five New Zealanders live with a disability. According to EEO Trust this group provides a largely under-utilised set of experience, qualifications and skills. In 2005 EEO Trust undertook some research and asked disabled New Zealanders to rate themselves in regards to employability. Disabled people gave themselves high ratings for: reliability and trustworthiness, work ethic and people skills. Individuals also highlighted that they had a positive and can-do attitude and are passionate and willing to go the extra mile. While many companies recognise the potential some are missing out by not employing or accommodating disabled people. There is a huge opportunity to bring a wide range of skill sets into the New Zealand workforce. Many disabled people are innovators due to seeing the world from a different perspective. This insight should be recognised and realised throughout different industries and at many levels. Many companies that employ people with disabilities or mobility issues have a friendlier and safer work environment. In New Zealand, 99.78% is the accident safety rate for disabled people in the workplace. (Brake, 2001; ILO, 2003; Perry, et al, 2000). One challenge for many businesses is creating a safer environment for people with disabilities or mobility issues. Businesses that employ people with disabilities have to comply with minimum standards set by the Government. Some go beyond these minimum standards to extend every possible comfort to their disabled employees. As a business owner or manager where do you start? How do you go about helping your disabled employees become more productive by making their lives more comfortable in their work environment? Many workplaces provide access ramps. On the other hand, a handicapped accessible bathroom is rarely available. Why are accessible bathrooms important in the workplace? 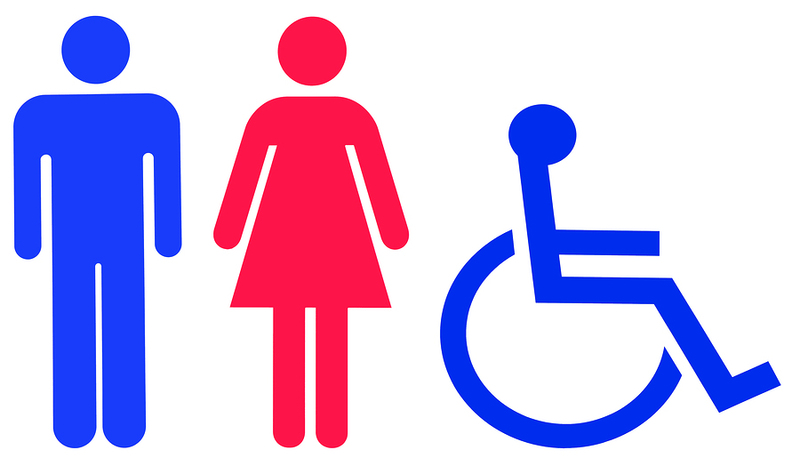 A disabled access bathroom is a must for every work environment. This is neither segregation nor giving special treatment. This is about giving every employee enough space to move freely around the work environment without obstruction and without disruption in any office activity or workflow. Commercial disabled bathrooms include specialised bathroom facilities and equipment like a: toilet seat, lever, backrest, basin, accessories like automatic hand dryers, liquid soap and toilet paper dispensers, shelving, and pull down rails, grab rails and handrails. These facilities and equipment have specifications that must meet the safety and health standards for people with disabilities and mobility issues. For people who are using wheelchairs, it is necessary that bathrooms are readily and easily accessible. The facilities and equipment must be positioned in such a way that a wheelchair user can move around the bathroom without obstruction; be able to transfer himself with less difficulty; and be able to use the facility accordingly and without danger to himself. Diversity in the work environment makes a business flexible to accept change and facilitates an invaluable perspective for businesses especially with the way it interacts with people from all walks of life. That is why employees with disabilities or mobility issues are priceless for any business. Their valuable contribution to the workforce should not go to waste. Disability access to different amenities in the workplace especially bathrooms should be observed as a standard by companies. With the right advice and guidance they are easy to install and setup. This is a small incentive you can offer compared to the innovation and passion that could be injected into your business.